That's Right, We're Not from Texas: Where have you gone, Dale Murphy? Our family got cable television in 1984, and with my access to TBS (Ted Turner's Atlanta-based "Superstation"), my love affair with the Atlanta Braves began. This week's news that the Braves are being shopped around to new owners will do nothing to change that, but it puts me in mind of the days when I would sit in front of the television and record the events of the then abysmal franchise's games in my official baseball scorebook. 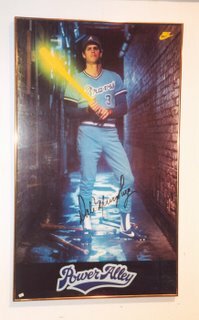 Yes, before the tomahawk chop and 14 straight divisional championships, I was a Braves fan, and Dale Murphy was my baseball idol. In 1990, the 7-time All star was dealt from the Braves to the Philadelphia Phillies where he stayed for two more years before being dealt to the Colorado Rockies. He retired in 1993 with 398 career homeruns, but it was in 1990 that my rabid interest in professional baseball began to wane. Murphy leaving Atlanta felt like the end of an era. Murphy had been with the Braves since 1976, the year Ted Turner took ownership of the organization, and he was the kind of player that seems to have become somewhat of an endangered species in professional sports. He was a 2-time MVP, a superstar and a family man who was often teased by his teammates and the media for his wholesome image. A reporter once tried to find out if Murphy was really as good as his reputation. After an exhaustive search, the only "dirt" he could find was a speeding ticket Murphy was issued for driving 35 MPH in a 25 MPH zone. He was late for a speech he was to give at a church. He was a player with principles who would take his teammates out to dinner but wouldn't pay for their alcohol. Now, he has written a book to guide athletes through the tough decisions they will have to make as a professional, and he is still a great humanitarian whose involvement in different charities are too numerous to mention. On the field, he was a 5-time Gold Glove winner with a rifle for an arm, and he was especially speedy for a big man. In fact, he was the 7th player in Major League history to join the 30/30 club (30 homeruns and 30 steals). The feat has now been accomplished 36 times by 21 different players since Murphy did it in 1983. In the era before rampant steroid use, he was the product of hard work and good genes. I got to meet him at a Nashville Sports Council luncheon in 2001 where he spoke to the attendees about his career as a major leaguer. After the event, I got him to sign my Power Alley poster (like the one above), and I shook his hand (it swallowed mine). It was a great moment for me, and one that I'll never forget. For all his accolades, Dale Murphy has not made it into the National Baseball Hall of Fame in Cooperstown. 2006 marks his 8th year on the ballot, and the results for this year's voting will be announced Tuesday, Jan. 10, 2006. I hope he makes it in this time, but even if he never does, I'm sure Murphy will consider his life just as rich and fulfilling without the honor. It won't change the fact that he was the greatest player I ever saw play the game either.